Last week I shared an indie spotlight on the Esty shop Different Dimension. Today I have another set of swatches to share with you. These will be the four "Mean Girls" themed polishes that are offered in the shop. 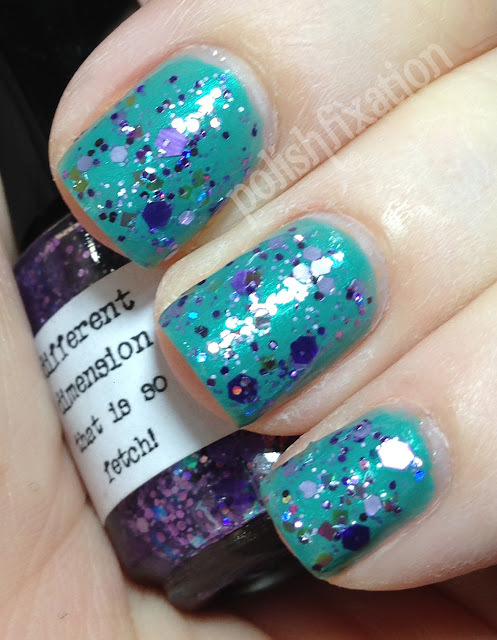 I was super excited to see that there were polishes themed after this amazingly fun movie that I've loved since the moment I saw it in the theater so many years ago that I now feel sufficiently OLD. I layered Boo, You Whore! over a slate blue cream polish. I adore this particular look!! I love the mix of glitters in this blue jelly base. So pretty! Plus, the name (of course) is awesome! Social Suicide is a black and white glitter mix, a bit different from the normal takes on it, as it doesn't not contain bar glitters and it has an abundance of very small black and white glitters. I really like this one a lot, though I think I'd like it more if there was a slightly smaller concentration of the tiny glitters. That Is So Fetch! is s predominantly purple glitter topper with also some iridescent glitters in the mix. The glitters are in various shapes and sizes and are absolutely gorgeous. I really love how it looks layered over the blue/mint polish in the above picture, but it would really look great over a wide variety of colors. A polish collection based on "Mean Girls" would not be complete without a pink-wednesday polish! 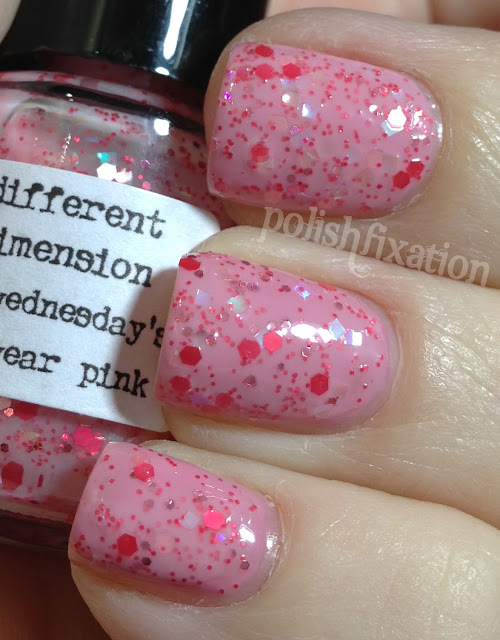 On Wednesday's We Wear Pink is is sheer pink creme base with glitters of different shades of pinks/reds etc in various shapes and sizes. I love this polish, which I chose to layer over a similar pink creme, though could probably be built up in a few coats. Overall I love this collection and think the colors and names were perfect nods to the movie which they were based upon. Love it! The polishes retail for $8.50 per full sized bottle, but for a limited time (5 days still remaining!) my readers are being offered a generous 20% discount on purchases made using the discount coupon code "FIXATION20" at checkout! What do you think of these polishes? Do you like the movie Mean Girls as much as I do? I just received On Wednesdays We Wear Pink yesterday. It's such a pretty polish!! Love your swatches. Cute collex-too bad about the grammar error on the pink one.